Gmail has a very powerful search feature. However, most users don’t realize its power and flexibility. 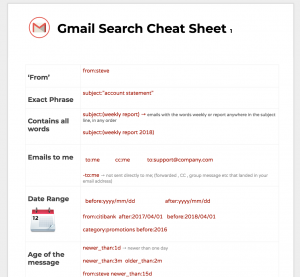 Here is a Gmail search operators cheatsheet filled with examples and common uses. Download & print it and keep it in front of your desk for easy reference.